CA Service Operations Insight is an advanced IT business service management solution designed to integrate with application and infrastructure domain management and other tools to build real-time views of service status. This business service monitoring software analyzes and pinpoints service problems to help your organization speed remediation and mitigate business risks. CA Service Operations Insight can help optimize your operations by offering automation which can be used for: service discovery, modeling and analysis; service impact and risk alert escalation to service desk; change management and SLA teams; and data center and cloud remediation of service problems. This business service management software can help you decrease or eliminate the heavy administrative overhead associated with traditional service modeling with dynamic business service modeling. Intuitive dashboard displays enable you to view your business service status in real time, including metrics such as service quality, risk, availability and operational SLA compliance. Data from business systems and service desks can also be displayed with operational service metrics. From the dashboard, you can launch a technical operations console for service visualization, impact analysis, alert details and automated actions for remediation. CA Service Operations Insight is a key component of the tightly integrated Service Assurance solution from CA Technologies. Our approach to service assurance can deliver a more effective and dynamic way to deliver IT-dependent business services, to manage physical, virtualization and cloud computing technologies and to leverage your existing investments in CA Technologies, third-party or custom IT management tools. Dynamic business service modeling builds and maintains real-time, end-to-end models of business services based on a variety of advanced technologies (transaction discovery and mapping, policy-based relationship discovery, real-time updates of imported infrastructure models). Service analytics and alerts pinpoint service quality problems and risks, helping to decrease or eliminate traditional manual triage across domains and prioritize actions based on business impact. 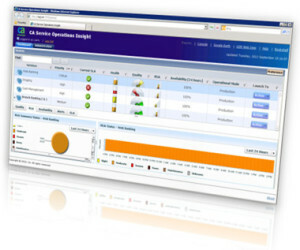 Service-driven automation (escalation, synchronization and workflow) enables service-impact alerts to trigger actions such as: business-relevant service desk tickets and processes; service model, alert and maintenance flag synchronization between integrated tools; and workflow for allocation of data center and cloud resources according to service priority, alert severity and business requirements. Integrated SLA performance management measures service quality and availability according to internal and external customer expectations. This helps operations teams to focus attention on key services and to proactively take action before operational SLAs are violated. Unified event management enables operations to correlate and transform cross-domain events into higher quality, more actionable alerts and exert more control over how alerts are prioritized and escalated. This helps you detect and correlate critical cross-domain events and escalate them according to standardized best practice policies. Improve service quality by quickly pinpointing sources of service-impacting issues across all technology domains to find and fix problems quickly. Improve service predictability by pinpointing sources of risk to services across all technology domains—so you can address those issues before they impact quality. Optimize operations by reducing the manual labor for alert and service management, reducing triage and mean-time-to-repair of service issues and improving cross-discipline communication and collaboration.